One of the most important items (and commonly missed) is that the projects you carve need to be “Under The Rollers”. To do that, you need to make your actual project board 7” longer than the “fake” board that appears in the Designer software when you are laying out a project. Make absolutely sure that your real board size is AT LEAST 7″ longer than the “virtual” or “fake” board in Designer. When setting up the project at the machine make certain that you stay under rollers, the project should be Centered On Length, do not cut board to size, and if you ever see an option on your LCD display for “fit project” or “resize to fit” (or anything like that) select “NO”. Just remember, you don’t normally want the machine to resize your projects in any way at all, nor do you want the machine to cut your board to size. Avoid those options, and you’ll be fine. Additional ‘little trick’ you can use if you want: Of course, YOU ALWAYS WANT YOUR PROJECTS TO STAY UNDER THE ROLLERS, but…here’s a little ‘trick’ to avoid ANY resizing option at all…that is to LIE to the machine when you are at the choice of “Stay Under Rollers” . 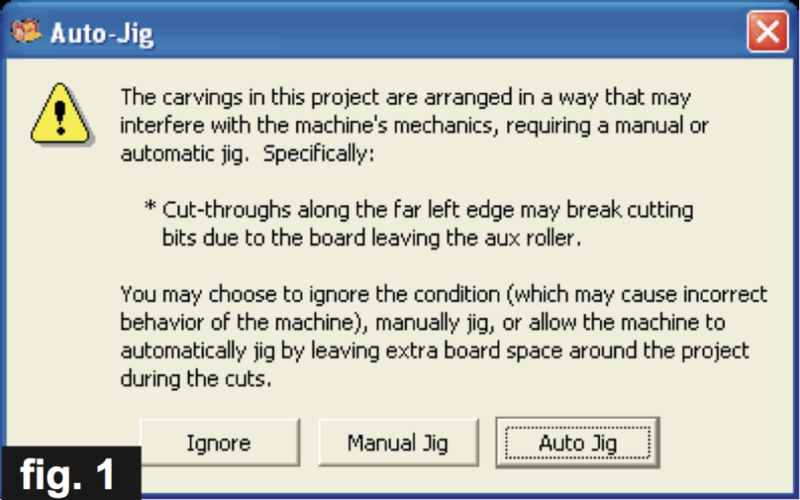 Because you already know that your project board will always be long enough to stay under the rollers automatically, you can LIE to the machine and tell it NOT to stay under the rollers (you and I know that it really WILL, since your board is at least 7″ longer than the actual project to be carved- right?). By telling the machine to “not” stay under rollers, the option for resizing will not occur and you cannot accidentally tell the machine to resize your project. (Again, the project REALLY WILL stay under the rollers as long as your board is at least 7″ longer than the actual project carve. Naturally, you will still want to select the “center on length”, don’t cut the board to size, etc.. during the setup. NOTE: CarveWright recommends 3/4″ clearance at the top of the board for any cutpath, but I’ve found 1/2″ clearance will miss the aux brass roller alright when doing a cutpath, no problem. Use your own judgement! 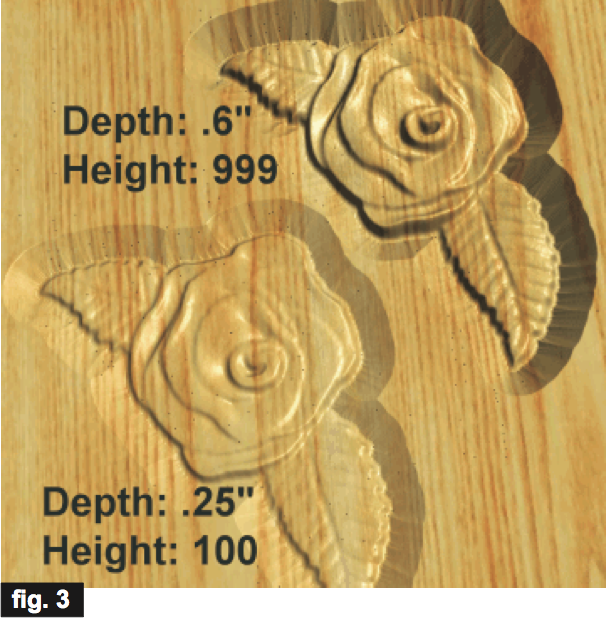 If you follow the setup instructions outlined above, you can be assured of success when carving/cutting your projects. Some may ask, “If I make my board 7” longer than my Designer board, won’t that be wasting some wood?”. Yes, 3.5” on each end of the board is not used and can go into your recycle pile. There are other methods of setting up a project that eliminate the 3.5” “cutoff” scraps, but that’s a more advanced topic. Right now, especially if you are just starting out, it’s better to deal with a couple scraps than risk spoiling a project! This is a fairly common inquiry from new-carvers. It’s very easy to accomplish. You simply assign a Carve Region to any shape (rectangle, square, oval, circle or irregular shape, even a pattern!) onto the board surface and place your “design elements” within that region. The region is carved out around your elements and makes them appear to rise above the board surface. 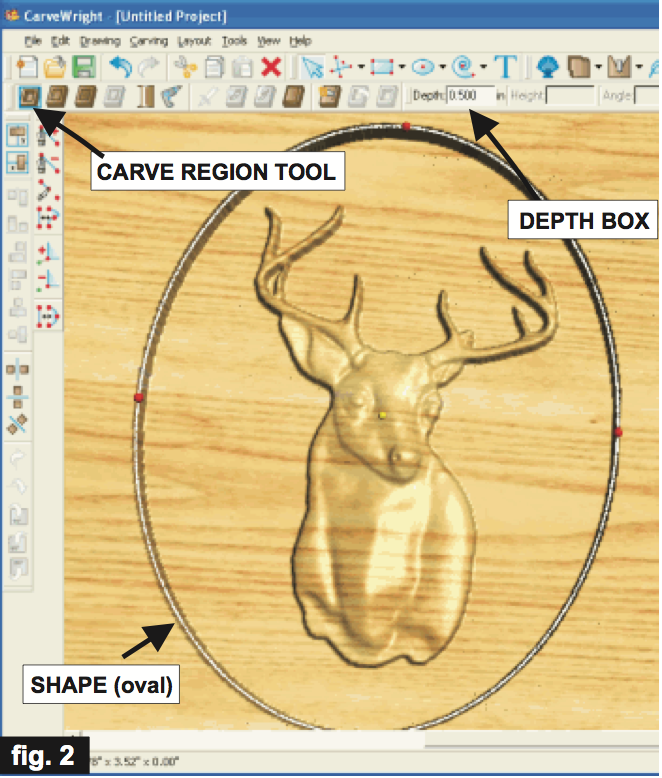 Draw your shape and, while your shape is still selected, click the Carve Region Tool. It will create a recessed carve region automatically at .25” deep. You can manually change the Depth just by typing in a new value in the “Depth” box on your screen. Drag a pattern from the Pattern List (click on the Blue Shell icon or select View/Toolbars/Pattern List from the Designer menu to view the Pattern List) into the Carve Region. Now set the Depth of the pattern to at least the same as what you set for the Region. Experiment with both Depth values until you achieve the ‘look’ you desire. You can create this same effect with text as well. I think we’ve all noticed that some patterns tend to lose some of their detail at some point after enlarging them on the board. To restore detail, simply increase both the Depth and the Height settings and you will start to see your details come back! 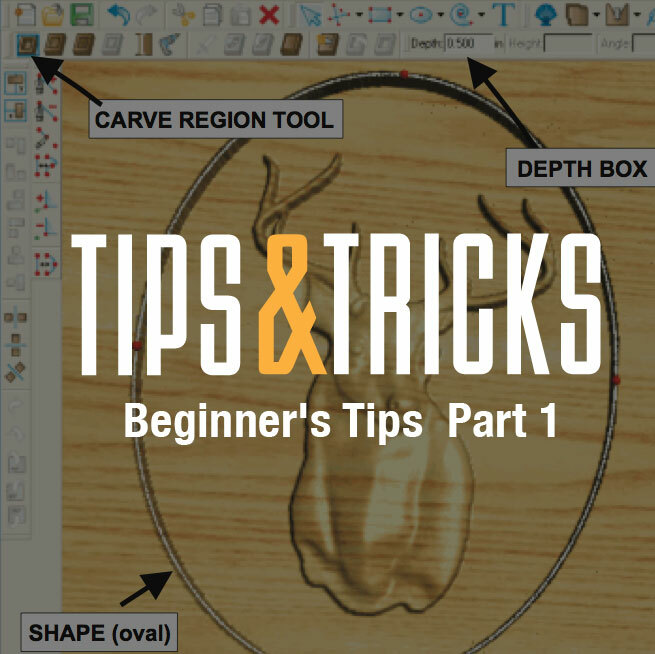 HINT: If a pattern already has a “deep depth” to begin with, reduce the Depth to a small amount first, before enlarging, then increase the Depth and Height after you’ve enlarged the pattern in order to bring back the detail again. And see it in application in the video below. This entry was published on August 2, 2018 / Joe Lovchik. Posted in Tips and Tricks. Bookmark the permalink. Great idea! Pulls the many resources together nicely. As an experienced user I find it a great review source. Looking forward to next articles. Thank you! Excellent update and links to additional supporting tutorials and info! Not just for Beginners, but also great reminders for experienced users as well. Thank you, Joe!